Following a recent conversation with previous TCC member Jess Rhodes-Jones I thought it would be useful to share some information with the TT riders in the club. 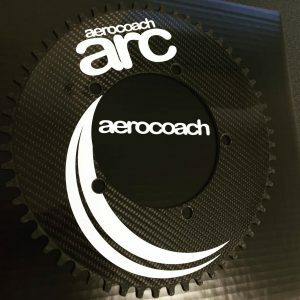 “I run a single 54T non-circular ring (subtly non circular – we make a ring that is designed for the high inertia of TT riding – link here: AeroCoach ARC chainring), but think I’m going to change to our 58T for faster courses this year, as it’s only 1 sprocket difference but have spun out on downhills on some courses. Cassette is 11-28, but I can’t currently use the easiest 2 sprockets as they rub on my disc (just a cheap Chinese one). Changing to an AeroCoach disc this year so I’ll be able to get into the easier gears for hilly TTs. For hilly TTs, I put my front mech back on, and have a standard 53-39 crankset, with the same cassette. I’d only swap to the double crankset if the hills are steep – I ran a single ring for the Albi amateur world champs course, which was definitely rolling, but no hills particularly steep. Weighing in at only 112g (54t), the solid aero ARC allows you to remove the front derailleur for even further aerodynamic gains due to the special tooth design to retain the chain. The ARC’s subtle shape is designed to mimic the firing patterns of your leg muscles whilst riding, increasing the gearing size when you most need it. The ARC increases gearing quickly at the beginning of the pedal stroke as this is when the main force producers activate (gluteus maximus, vastus medialis & lateralis, as well as the tibialis anterior). 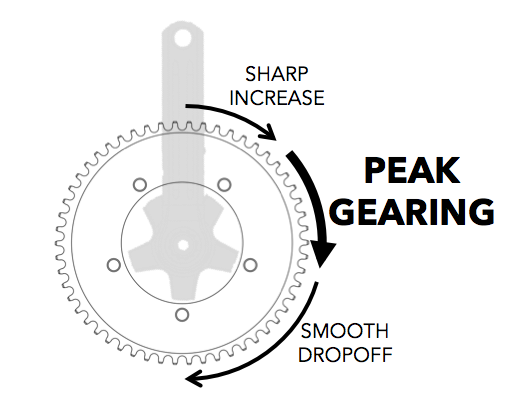 After this period gearing is maintained all the way through the highest torque phase before gradually decreasing down to a minimum gearing at bottom dead centre. This smooth dropoff is when the effect of gravity and the lower leg muscles come into play. The unique time trial specific design will help increase power output by 3-5w, and allow a smoother pedal stroke than normal. Unlike other noncircular designs you can train on the ARC ring without causing a detriment to your pedal stroke and swap between round/ARC rings without difficulty. In addition, there will be little to no power inflation (<1%) when using the ARC on a crank/pedal based power meter. ARC 54t & 58t chainrings are designed for the 40-55kph speeds involved in time trialling and fast triathlon riding. These are high inertia scenarios, where pedal speed is much more consistent than situations involving low inertia (such as climbing). Therefore the ARC carbon rings are optimised with a subtle noncircular shape. ARC2 52t chainrings are optimised for 30-45kph. As the inertia is lower, the ring design is more pronounced. ARC 52t rings are ideal for lower and/or changeable speeds, such as in triathlon, criterium racing or for fast training. The ARC has a full aerodynamic design with custom long teeth to retain the chain, meaning that you can remove the front derailleur. This can save between 1-4w at 30mph depending on the size of the derailleur. It is not recommended to shift using a front derailleur as this may damage the long teeth and will void the warranty. We advise to shorten the chain 1-2 links, ensuring that there is still sufficient length in the largest sprocket on the rear for best chain tension. The B screw on the rear mech should also be set to improve chain tension, please refer to the manufacturer’s details for adjustment. The carbon ARC chainrings are thinner than a normal chainring, and so in some cases placing spacers in between the ring and spider will improve chainline if the chainline is less than standard. Please ensure that the chainring is protected at all times when not riding the bike, and that framesets with no wheels on are not rested with the chainring touching the ground, as ARC’s long teeth will protrude and may get damaged. We can manufacture carbon ARC rings for custom BCD to fit your exact crankset: if you need a chainring with a non 130BCD fitment, then please select the custom order from the drop down list above, and send our team a message with your requirements in the Order Comments box whilst placing your order (eg. Shimano 4 bolt 110BCD). If you choose the custom BCD option please allow at least 3 weeks for delivery as we build the ring to your specification.